Implants are a revolutionary and advanced technique for replacing one or more missing teeth or anchoring dentures in place. Implants offer a more natural appearance, lower maintenance and a long life of service. We pride ourselves on being the implant experts. We use both the Biohorizons and the Nobel Biocare implants to treat a variety of patients. 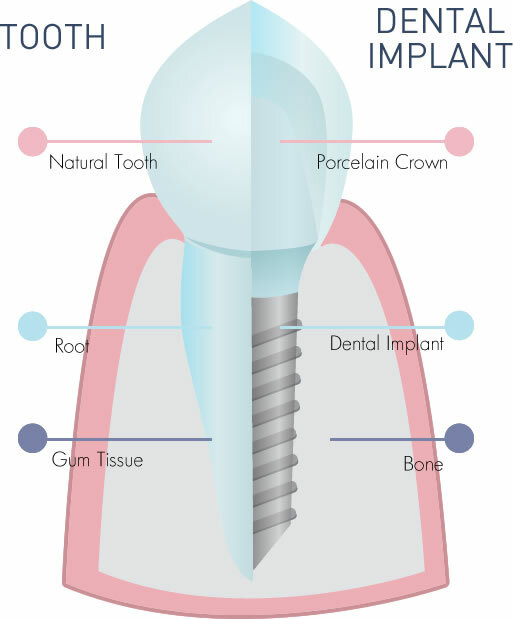 Implants consist of a titanium screw that integrates with the jaw bone to create a secure foundation for crowns, bridges or attachments to hold dentures in place. This advanced technique has proven popular with patients wanting a low maintenance alternative to dentures. Once the titanium rod screw is in place, we allow the jaw bone to heal around it (osseointegration) for roughly 3 months. During this time of integration, it’s standard for the patient to wear a denture to temporarily fill the gap. Once the screw is fully integrated, it is fitted with a single crown, bridge or removable denture. The entire process generally lasts between 3-6 months. Dental implants transmit chewing forces to the jaw, stimulating it and halting the bone loss associated with missing teeth. 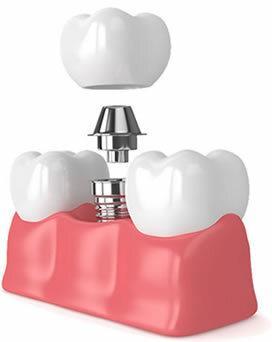 Dental Implants do not require the grinding down of healthy teeth for abutments. 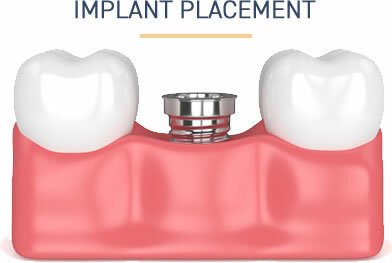 Implants restore the ability to chew properly, allowing a complete and healthy diet. Initially, one of our resident dentists examines the condition of your teeth to see if there are signs of gum disease or if pre-treatment, such as cleaning or therapy for removal of decay is necessary. Thereafter, our implant dentist will assess your mouth, bone structure and identify the implant locations by X-ray or a Computerised Tomography (CT) Scan. Once discussed with you and with your approval, our laboratory custom-creates the titanium implants and crown or bridge for you. Our dentist then provides you with a local anaesthetic so that you feel no pain during the procedure. When sedated, a slit is made in the gum and a tiny hole is made in the jaw bone for the implant. 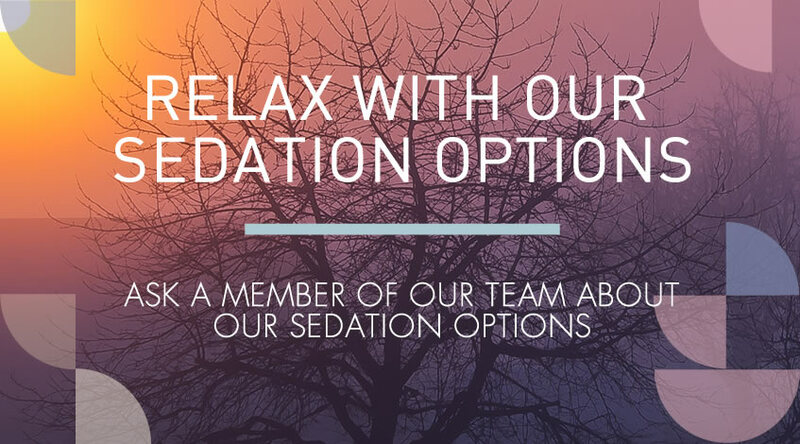 You can find out more about our sedation options here. The implant is then fitted into this little hole and the gum is mended over with soft sutures to allow fusion with the jaw bone. These may be removed after a week. In some cases, people have damaged jaw bones and our resident dentists may take a bone graft from either the lower jaw bone or from safe substitute materials to build up the jaw bone that holds the implant. 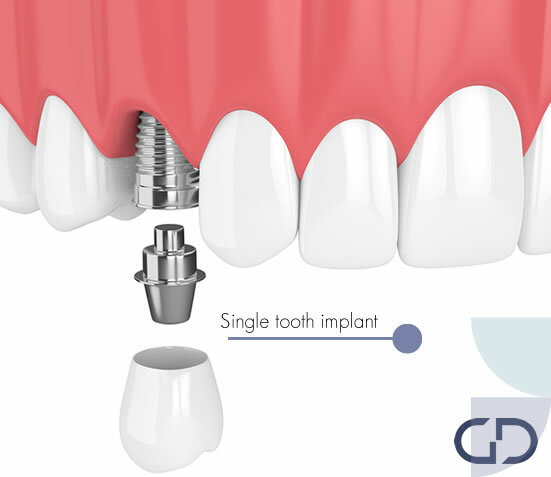 After the bone tissue has attached to the implant over a six week to six month duration and healed, the surface of the gum is opened again to allow for fitting of a temporary crown post to the implant (known as abutment). More healing occurs over another month as the mouth gets used to the ‘new natural tooth or teeth’, and then the permanent crown or bridge is fitted. The crown or bridge looks like a natural tooth while the implant is hidden out of sight beneath the gum. CT scans can be incredibly helpful to our dentists when planning your dental implants. 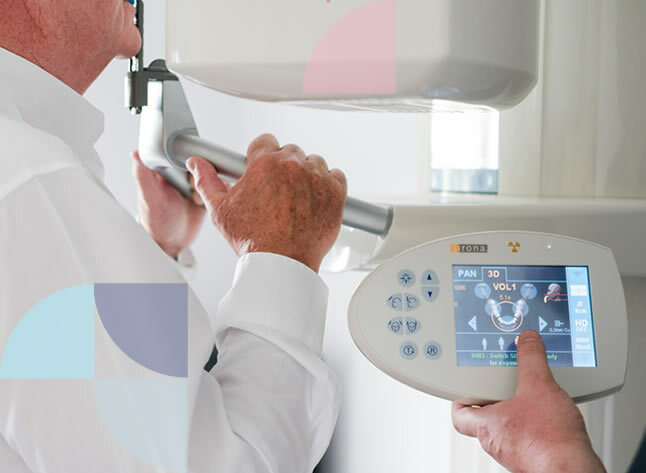 CT scans provide highly detailed views of your bone structure, bone density, tissues and nerves that we can’t see with traditional dental x-rays. This state-of-the-art 3D imaging allows your dentist to assess the quality of your jawbone which helps them determine the very best spot to place your implant and the appropriate size and type of implant needed. CT scans also make the implant process faster because your dentist can plan out the entire procedure in advance which then reduces the time you spend at our practice whilst also giving you better results. New teeth in just one day! Many people who have full dentures have no problems with them whatsoever but in some cases dentures are loose fitting, sore or cause irritation. 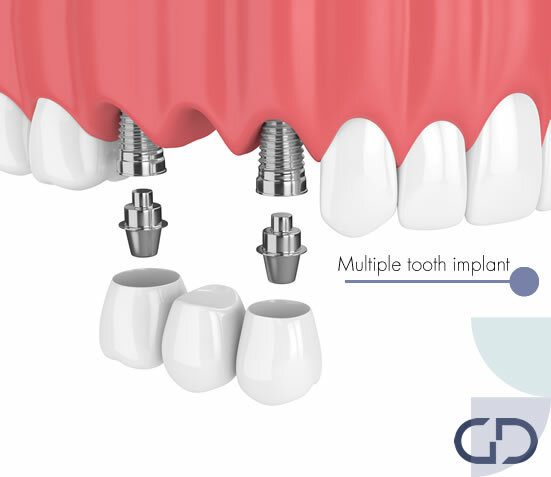 Gentle Dental offers a unique treatment that uses dental implant technology to restore your smile whilst reducing the risk of bone loss. Best of all, you can have a new set of better fitting (and looking!) dentures in as little as just one visit. 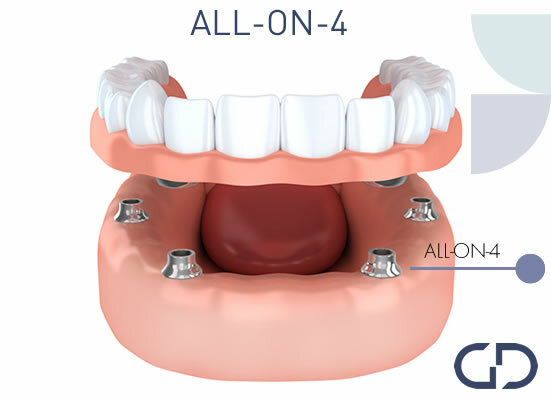 All-on-4 uses the placement of four titanium implant anchors which are placed into your jaw, where they will grow into the bone (or integrate) and a temporary bridge is fitted- all in one day. 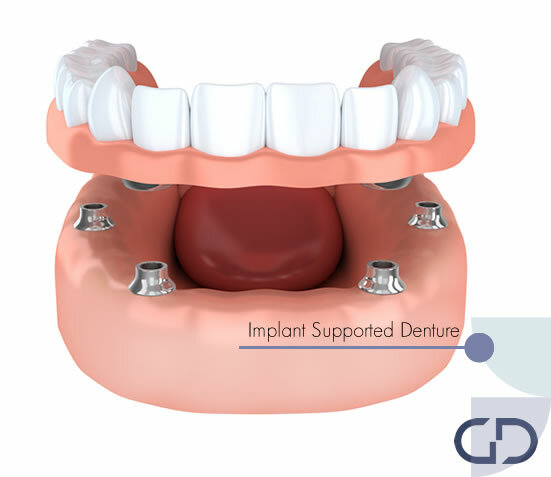 After about 3 months the implants should be fully integrated and your permanent dentures will then be put in place. 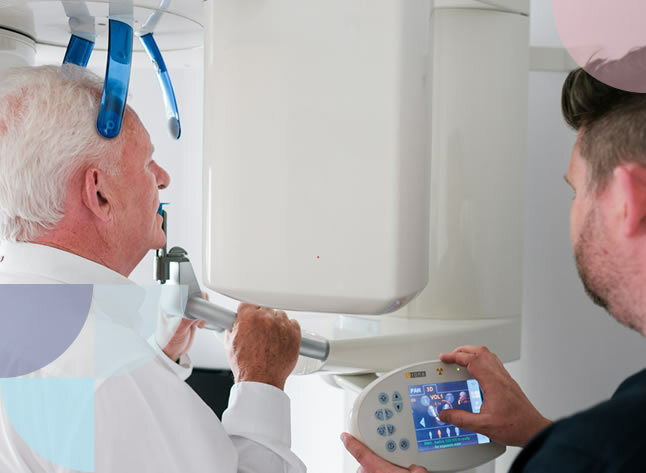 By using our cutting-edge 3D CT scan technology we can ensure that your new teeth will look and feel amazing, have greater stability and last longer than traditional dentures. Caring for your dental implants is easier than looking after more traditional dentures and bridges. In fact, it’s like looking after your own natural teeth. Although the implant itself is not subjected to decay and erosion, the area around it is, so it’s important to continue seeing your dentist and hygienist to be sure it’s free from plaque and bacteria. Q. What are dental implants? Dental implants are artificial replacements for natural teeth lost due to tooth decay, gum disease, or injury. The implant consists of a titanium post that acts as a tooth root and is surgically fitted into the jaw. Either a crown or a bridge is attached to the titanium post as the substitute tooth. Titanium is a safe substance that easily fuses with the gum tissue to support the crown or bridge replacement teeth. 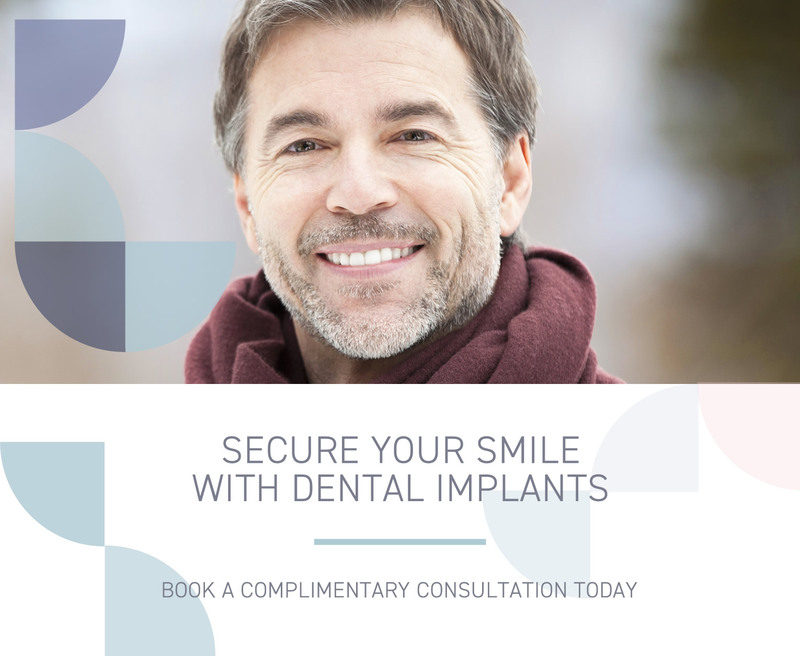 Our resident dentists will explain the implant process to you in more detail, explaining how our laboratory custom-makes the titanium posts, crowns or bridges to uniquely fit your mouth. Q. Who is suitable for Dental Implants? Dental implants can be placed in most adults who are in good to moderate health. They are not typically placed in adolescents until they have reached their full expected height. Certain uncontrolled medical conditions may decrease the effectiveness of implant treatment, so be sure to discuss your full medical history with your doctor before beginning treatment. Every patient is different and patient results may vary. Only a trained clinician can determine the best treatment plan for you. Please ask your doctor to explain the benefits and risks to see if tooth replacement with implants is right for you. Q. Who needs dental implants? Anyone who has lost part of or a whole tooth, fractured a tooth, or experiences loose teeth can see one of our resident dentists trained to identify when dental implants are needed. People involved in contact sports may experience oral trauma and need to have their teeth checked for damage. If you are concerned about losing a tooth or have missing teeth, we can take a look and advise you on the best options to have natural looking teeth. Q. Who may not be able to have dental implants? Implants are not necessarily appropriate for everyone. Age is not a limitation, but bone tissue quality and gum condition may present risk to the patient. Other factors that may increase likelihood of implants not succeeding are excessive smoking because it deters healing, high alcohol consumption that affects the gums, advanced gum and bone tissue deterioration from periodontal disease, patients with auto-immune disease that also affects healing-rate and fusion of the implant to the bone. Excessive teeth grinding is also a condition that can stall implant treatment. Our experienced implant dentist can discuss these conditions with you and examine your mouth to see if you are a suitable candidate for dental implant treatment. Q. Do I need to have an implant if my tooth is missing? Fractured, broken or missing teeth can seriously affect oral health and overall well-being. This is because a broken tooth can become irritated with inflammation and cause tooth decay. This can lead to gum disease that can also cause illness in the rest of the body. Missing teeth can affect the way teeth bite together which can cause grinding down of other teeth. Over time, the jaw can appear distorted which can affect the shape of your face and overall appearance. If you are concerned about this, one of our resident dentists can discuss your concerns with you and advise you on the condition of your teeth. Q. Is dental implant treatment painful? When you are given a local anaesthetic, you will not feel pain during or shortly after the procedure. As the anaesthetic wears off, you may feel some discomfort, and while the implants are healing, there may be some inflammation and tenderness. Each patient also feels varied levels of pain according to how they are made. You can discuss any fears you have with our resident dentist and also your needs in pain-management. Our resident dentist will discuss with you how to reduce and treat any discomfort or tenderness, so that your mouth feels back to normal. Q. What are the advantages of dental implant treatment? The benefits of having dental implants are that you will have a full set of natural looking teeth again, your bone tissue and jaw structure will be much stronger, you will also have received treatment for any gum disease or tooth decay, you will have much better oral and overall wellbeing, and your facial appearance will look much more brighter and attractive. You will also feel a lot more confident when you smile. Q. How long do dental implants last? Dental implants are used internationally, and are long-lasting with a very high success rate. Research has shown that some people wear their implants up to thirty years. For strong teeth and gums, it is recommended to follow oral hygiene guidelines and to see our resident dentist periodically for a check-up. By doing so, we can help you identify any challenges with your oral health early and provide you with the relevant treatment you need. Q. Are there follow-up appointments after the dental implant procedure? Dental implant procedure as discussed above, does take from six weeks to six months depending on the patient’s rate of healing. 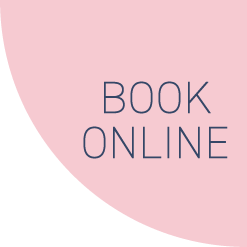 During this time, there are follow-up appointments with our implant dentist to check that all is progressing well with your oral wellbeing. 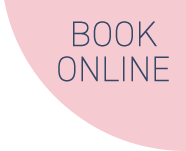 You are also welcome to phone us and discuss your needs at any time, and we will give you advice on caring for your new implants. In some cases, patients wear bridges or dentures as temporary substitutes while the implants heal. Our resident dentist will also advise you on caring for these substitute teeth. Q. How do I look after my dental implants? Dental implants are a replacement for your natural teeth. The crown or bridge is the tooth part and the implant is not visible after it heals beneath the surface of the gum to the bone tissue. Looking after these dental implants is not much different to the way you would look after your natural teeth. Sometimes implants are placed next to natural teeth. Patients may have one, two or a full mouth reconstruction. Making sure you brush twice daily with the correct brushing technique, use a fluoride containing toothpaste and chlorhexidine mouthwash, and floss at least once a week helps to prevent tartar and plaque build-up. Chewing sugar-free gum after meals also contributes to good oral hygiene. Avoiding any damage to the implant site is crucial, so gentle brushing and eating of soft foods initially is recommended. Visiting our dental hygienist for regular check-ups will also help to maintain both your natural and implant teeth.